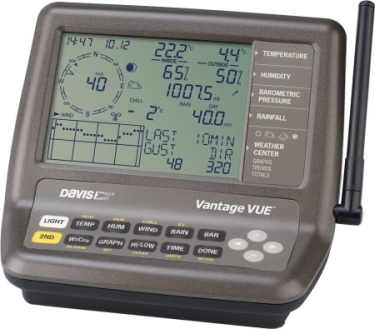 Vantage Vue also boasts the innovative Weather Center button that displays additional data on weather variables for today and over the last 25 days. Multiple features included at an affordable price. Vantage Vue includes a compact outdoor sensor array and an indoor LCD console. The fully-integrated, corrosion-proof sensor suite is built to take all the weather your location can give - freezing winters, springtime thunderstorms, blistering summer sun, and brisk autumn winds. The smaller profile sensor suite is designed to minimize visual impact in your yard or on your roof. The sensor suite transmits data wirelessly to the easy-to-read Vantage Vue console. With a range of up to 1,000 feet (300 m), Vantage Vue data packets are sent every 2.5 seconds to the console. Because Vantage Vue's transmitters are radio-compatible with Vantage Pro2, you can mix and match components. For example, add a Vantage Vue console to your Vantage Pro2 system or extend your wireless range with long and short range repeaters. They all work together seamlessly. VARIABLE DISPLAY OPTIONS - See updated values every 10 seconds for heat index and wind chill to get a better "feel" for the outside environment. USER-FRIENDLY KEYPAD - Domed buttons are easy to feel and press. Glow-in-the-dark keypad buttons give you access to weather information at night. The "Done" key returns user to "current" screen from anywhere in the program.